If you’ve used Facebook, you might be aware of the “Recommended” feature. Twitter has now introduced a similar “Who To Follow” feature, a few days back. While Facebook recommends people or pages you’d like to connect with, the Twitter feature suggests people who you may like to follow. With more than a hundred million users on Twitter, there are sure to be at least dozens of accounts out there that will reflect your interests. The trouble is finding all of them. Recently Twitter began rolling out a new feature to help address that — “Suggestions for You”. 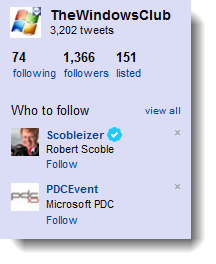 The algorithms in this feature, suggest people you don’t currently follow that you may find interesting. The suggestions are based on several factors, including people you follow and the people they follow. You’ll see these suggestions on Twitter.com and the Find People section. If you like a suggestion, click “follow”; if you don’t, click “hide,” and we’ll try not to suggest that user again. Can you see this new feature on your Twitter homepage ? If you go to your Twitter profile, you would start seeing a small box with two suggestions below the Followers / Following count. These suggestions will change on every refresh. It is left up to you to follow or ignore these suggestions. Actually this feature works like this – when you click on the view all link below the suggesting feature, it takes you to the find new people page where actually it works based on people you’re already connected and who they follow which Facebook already has. This feature is really helpful in finding out new people having similar tweets and likes. It will help you identify new people to follow. If your tweet quality is good you too can in turn get more followers. By the way, if you’d like to follow us on Twitter, you can do so here ! Yes, I’m getting this feature since 2 days and I’m liking it.